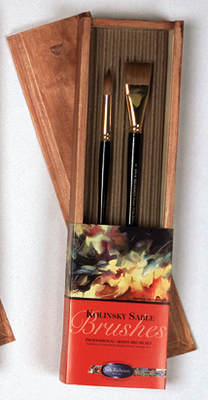 Unleash your refined artistic element with this elegant Richeson Wooden Box Sable Brush Set. It will make the perfect gift for an artist friend or family member. You can even use it as a collector’s item to remind yourself of your ability to capture the essence of the world on canvas. The Richeson Wooden Box Sable Brush Set is an artist’s dream. The soft but full bristles will allow paints to flow smoothly and with unified color distribution. The gold-tinted base gives the set a majestic look that any passionate artist will appreciate. The varnished wooden box that encases the set adds to its absolute glamor and allure. The top of the box gently slides off for easy access to the most important tools that an artist will ever have to grab. In its entirety, the set can make a lovely addition to a paint room. The Richeson Wooden Box Sable Brush Set contains two brushes. The package includes one #14 round brush and one 1-inch flat brush. The recipient of this lovely gift will enjoy adding a large amount of detail to any new creation.